For me Segway is one of the strangest contraptions. But it is funny and I think it has a future. 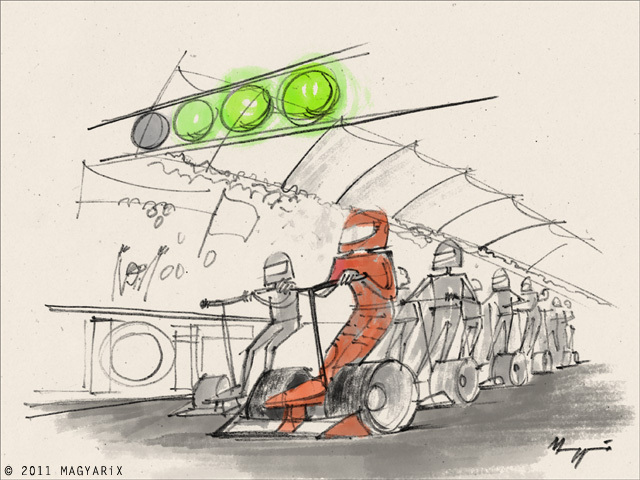 This week's drawing of mine is a vision about the Segway world championship series, just like Formula One or IndyCar. I made their tyres wide, I think at about 900-1000 Horsepower they will need that. I also think they will need a front wing because of the down-force, so they don't fly away. I must contact Adrian Newey. I think it's a great idea. It would be fun to watch a high-speed Segway race. On the other hand, I'm so glad they're too expensive for average people to own. Could you imagine what sidewalks would be like if they were as trendy as smartphones? Honestly, I can't take anyone seriously when they are on one of those things. These guys definitely look more intimidating than any cop I've ever seen on a Segway though! Great, original idea, and I love your lovely sketched lines. The splashes of color are perfect, too!